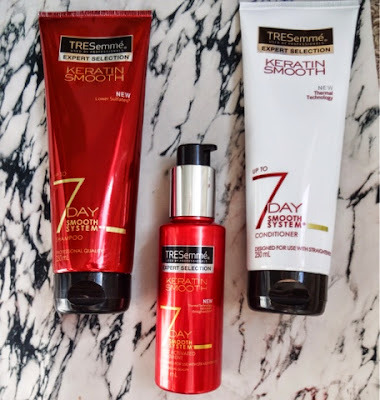 Today's post is going to be a review of the Tresemme Keratin Smooth range - the shampoo, conditioner and the 7 Day Treatment, which I've started to use. Because what you use to wash your hair is so dependent on your hair type, I'll state that mine is fine (but with lots of it) and very dry and damaged. I bleached it blonde for quite a few years, and I use heated styling tools most days. As a result, my hair is not very shiny and can easily look a bit parched. I believe that your hair gets immune to the active ingredients in shampoos and conditioners over time, so I always change the brand I use after I finish a bottle, but I generally rotate between three that I like - Tigi's Bed Head range, Herbal Essences, and John Frieda Brilliant Brunette range. 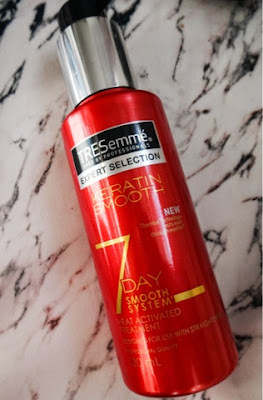 So this Tresemme thing is a completely new experience for me. 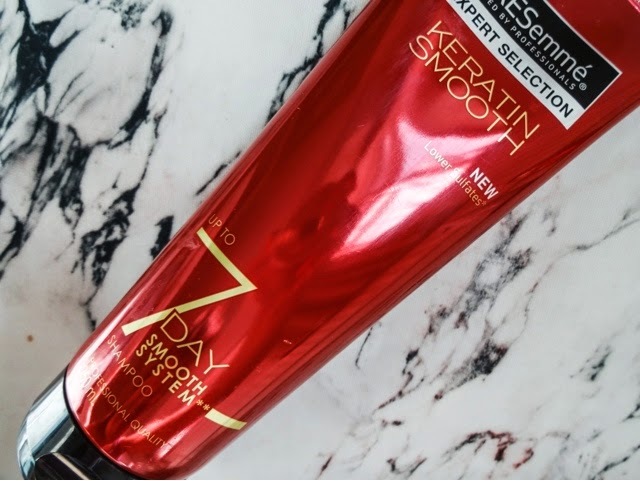 When I first tried the Keratin range, it was by accident. I was visiting my mum and I hadn't taken any shampoo as I knew she'd have plenty, so I decided to just use whatever she had in. 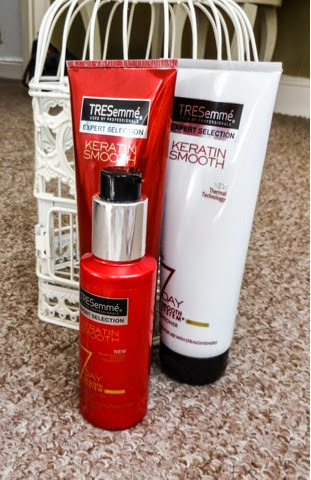 My heart sunk a bit when I saw it was Tresemme - I hadn't ever tried the line, but my hairdresser told me the brand got rejected by salons for being rubbish years ago and its a prejudice that's always stuck with me. But I thought it might be interesting to finally give it a try. The results convinced me that what lay in these little red bottles was pure witchcraft. My hair was silky, shiny and I literally couldn't stop touching it. Amazed, I resolved to pick some up when I next ran out. At Boots, I picked up the shampoo, conditioner and the leave in treatment product as well. They've been repackaged from the large black bottles into these sleeker looking squeeze bottles, which I vastly prefer. It makes the line look much more appealing. Luckily, there was an offer running, so although the products are normally £5.99 each for the shampoo and conditioner and £6.99 for the treatment, I picked up all three for £10. But would the products deliver at home? The line markets itself as '7 Day Smooth' and states that its designed for use with straighteners (and I assume other heated appliances) which is music to my ears as I can't be parted from my GHDs. Now, I'm going to state outright that the results I've had at home haven't been anywhere near as good at that first time. It sounds mystifing, but I've concluded that its all to do with the much softer water down in Cornwall, where my mum lives. The water in the East Midlands, however is fairly 'hard', meaning there are more mineral deposits in it, and I'm quite disappointed that the magical effects I had down south are probably more to do with that than with Tresemme. The shampoo and conditioner have lower sulfate levels than most, meaning they are much kinder to colour treated hair. Both products are infused with keratin, which is a protein that bonds to the hair's surface, filling in all the little dents, irregularities and breakages, and giving you a stronger, smoother strand that is uniform and reflects light better. To me, with my stressed out, dry hair that snaps off, this sounded like the answer. All of the products, especially the treatment, contain a complex of Polymers. These are heat-activated, so when you use your straighteners, you're sealing in the treatment and binding it to the hair shaft. 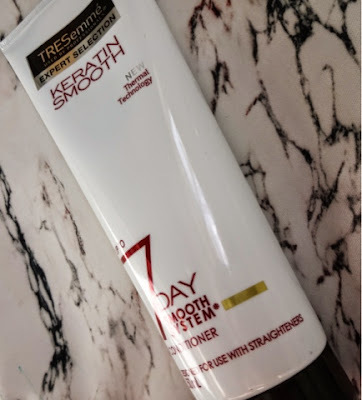 It promises a frizz-free, smooth and shiny finish that keeps on working over time - so the next time you straighten and the time after that etc, the treatment keeps working, even after washing again - for up to seven days or three washes apparently. After excitedly washing, blow-drying and wielding the straighteners, I was expecting nothing short of the miraculous result I'd had the first time. But although my hair did feel smooth, it wasn't noticeably different from any other half decent conditioner. The magical, soft as satin feeling I had when I tried it in Cornwall was noticeably absent, disappointingly enough. 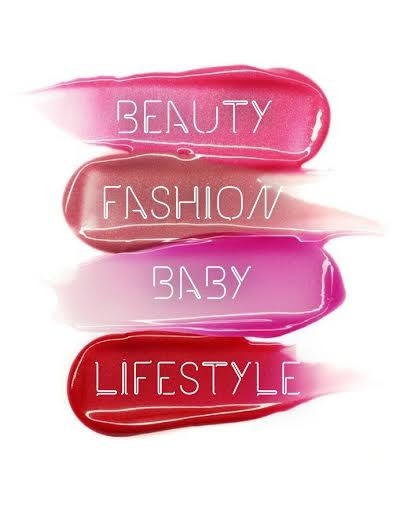 The products have a pleasant, faint fruity smell, like peaches and raspberries. The shampoo foams up nicely, especially for one with lower sulphates. I'm hoping the effects may accumulate over time, but on first impressions this hasn't been the wonder product I was hoping for. The treatment is like a thick cream - I added a couple of pumps to damp hair and combed through before drying and styling. This performed perfectly well but there was no big wow moment in the shine or the feel of my hair after use. It didn't make an impact on my usual haircare routine. Usually, I add a blow-drying cream or a moisturising oil to my hair after washing, and this gave the same level of results as that method, nothing bad but nothing that stood out either. I can see a slight improvement in texture and shine in the above before and after pics, but I'm not sure its anything I wouldn't get from my usual washing routine. Maybe this is a range that gets better with time and more uses, and maybe having it perform so well down south due to the softer water set up too many false expectations, but I can't say I'm bowled over, and I probably won't be adding the Keratin Smooth range to my usual round of brands. It hasn't performed badly, but I'm left feeling a bit flat that it hasn't been magic, either. I also think that it made my hair look greasier, quicker - normally I go three days between washing my hair because that's all it needs, but this time by the second day my tresses were looking greasier at the roots, which is not normal for me. The trade off in smoothness and shine that I was hoping to get isn't really worth the hassle of needing to wash every day or having it look greasy, so unless this dramatically improves on re-use, I doubt I'd buy it again. In ym book this is one to avoid, but there are plenty of very positive reviews of this. 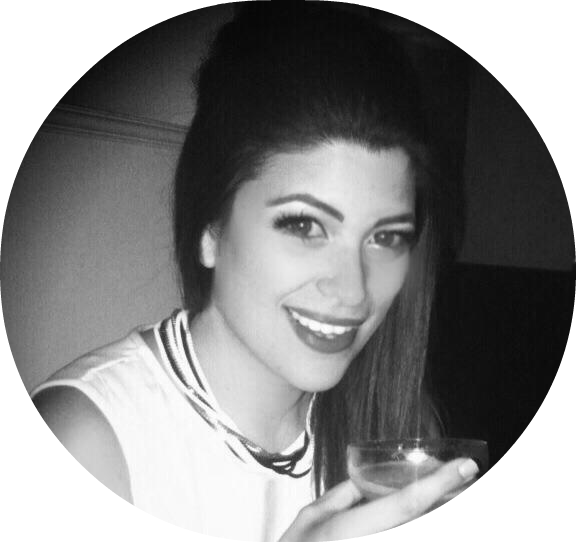 Perhaps its designed for coarser hair than mine - I'm not too prone to frizz, more fluffiness and flyaways, so it could easily be that the formula is just too heavy for my hair type but may well suit yours. 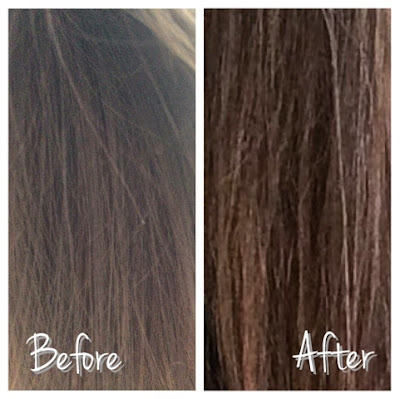 If you have fine, dry hair thought, this is one to avoid - save your pennies for better things! The East Midlands water is horrible. I wouldn't be surprised if it was southern water making the difference!